Italians love combining the tart and bitter with sweet and savory flavors and this recipe is a good example. This ‘primo’ course vegetable recipe is our take on a classic, simple and delicious dish. 1. Heat 2-3 tbsp olive oil in a large dutch oven or deep sauce pan over medium-low heat. Add the shallot (or onions, minced garlic) and optional hot pepper flakes. Cook slowly until the shallot begins to turn translucent (and, if using the onions, cook the garlic until it begins to soften – be careful not to burn the garlic, it will turn bitter). 2. Add the white wine and let come to a boil before adding the chicken stock. 4. 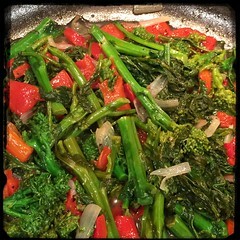 When the liquid is boiling, add the rapini, cover and let steam for a few minutes. 5. Mix well and as the rapini leaves begin to wilt, add the freshly squeezed lemon juice, mix well, cover and let cook until the the liquid reduces to about 50%. 6. Add the roasted red peppers and mix thoroughly. 7. Let cook until the liquid is reduced to your liking. Add salt and pepper to taste.